I have been training at the Paddock Riding Club for over 45 years. I provide a solid, basic training as a foundation to succeed with; -No gimmicks -No gadgets -No shortcuts. Every horse and rider have a different personality and traits which are addressed individually. I do not believe you can put everyone and every horse into one mold and treat them all the same. I have horses which range in age and experience from green to mature (a 29 year old thoroughbred still showing). I work with Warmbloods, Arabians, Paints, Quater Horses and crosses or any other breed that a rider may bring. My horses, a gelding, a mare and a Fjord impress everyone with their ability to perfom. The mare that started it all. 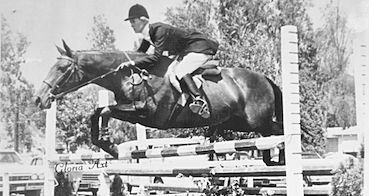 Starting her showing experience with a thoroughbred mare in the Green Hunter Division, and showing in the hunt seat classes, Jane quickly realized that her mount needed more schooling to be easy to ride. She would jump anything, and won - but was not easy. To better her hunter performance, Jane knew she needed to improve her horse's balance. 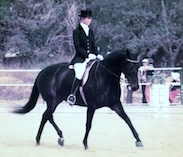 Serendipitously, Jane began her dressage background with this mare and a long association with Elizabeth Searle. Very well known as a dressage judge and on various dressage committees, Ms. Searle still continues to give a monthly clinic for Jane and instructs Jane and her students. Classical riding is the art of riding with, rather than against the horse, in harmony. I found you to be a rare breath of fresh air and integrity in an industry so corrupted with competition and gimmicks..